I wanted to write this post on learning to live with an illness and disability as I feel that everything in life is about love, caring for one another, sharing everything we have and giving hope and encouragement to others for the future. In the summer of 1970, at the age of sixteen I tragically went blind and my world, as I knew it came suddenly to an end. I had left for work as usual that morning to catching the bus like I always had, blissfully oblivious to the fact that my life was about to take such a colossal and rapid transformation. I arrived at work at Boots the Chemist in Gateshead just like I had every day, everything was normal and I felt fine. As I finished lunch with my colleagues an unexplained and sudden horrible wave came over me. Disorientated and confused, I remember the grotesque and surreal feeling as I could still hear the girls chatting and laughing in the background. I began to feel numb; I was terrified, confused and felt totally vulnerable. After that nothing appeared to be clear in my mind, a blur of noise and motion as I fell unconscious. In that cruel and unexpected moment everything in my life changed forever. I found myself waking up in the Queen Elizabeth Hospital, in a straightjacket with a tube stuck down my throat as my stomach was being pumped. I could not understand what had happened or what was going on, I cannot remember much more until I suddenly woke up in Dunston Hill Hospital jut up the road from where I lived. I had never been in hospital before and it was a truly hideous experience to go through at that young age. I had only been in a few days when three people had died on the ward. I was only a child and scared out of my mind. After eight or nine days I had another of those horrible bad turns. I awoke disorientated in a bright room, fuzzy and unfamiliar it seemed to move all over the place. My body felt like a tonne weight, as if someone was sitting on me. Tired and dazed faces appeared as if from nowhere, moving in slow motion making me violently sick. It was a deeply disturbing time, I felt very abandoned and isolated, a terrifying time that has haunt me ever since. They operated on me but there were complications. In just three weeks I had went from a vibrant young working class girl working on the counter in Boots to lying confused and paralysed from the chest down. At first there was a lot of confusion regarding what had happened but we eventually found out I had Epilepsy. These seizures and episodes had caused me to permanently loose my sight. When I first lost my sight I thought my whole world had collapsed and I fell into the depths of despair, which was the most terrifying place to be. The days were long and lonely, my brothers and sisters were at school, work or married. My friends had disappeared. I spent most of my time in my bedroom listening to the radio; I felt isolated and didn’t feel part of the family anymore. I was so unhappy. I eventually came to realise that nobody in this world owed me anything and if I wanted to succeed in life then it was up to me to do something about it. I had to let go of what I had lost and think about the future not the past. After all that is the one thing you cannot change! I began to set myself goals and was determined to go after my dreams and if I didn’t succeed at first then I would try again and again and again until I did. I set small ones at first, building up each time, ensuring I kept moving forward despite the set backs and obstacles, overcoming adversity. What might seem like a small victory can lead to amazing things and it all begins with that first step, that leap of faith. It’s all about think and focusing on what we can do and still very capable of if we put our minds to it. Never give up on yourself and always remember that we are all equal in this world, no one being better than the other. Always believed in yourself and remember that everything is possible. Stand tall, be strong, go forward and don’t look back. By doing just this I managed to do so much, somethings I would never have imagined I could have achieved back when I was stuck in my bedroom, isolated and in deepest moments of despair. I had learned Karate for a few years when could see. I decided not to let my condition stop me and began to learn once again. I had always wanted to get to black belt and set this as my goal. It was hard at first but eventually I managed it on January 1979, after training for 7 years. 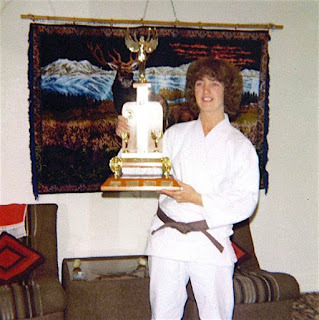 I was the first blind female black belt in the world. My Stella Williams trophy award for outstanding achievements in Karate at the Kata championships in Chester 1978. 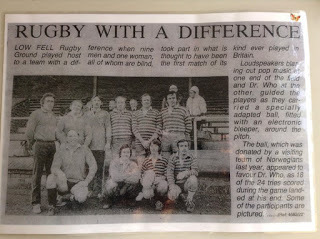 In the early 1980’s I was in the first blind rugby team in country. Trainers from overseas came over to teach our group. They were also blind and had set up similar teams in there own country. We trained at Gateshead cricket club. I had been the first female to join all male team. 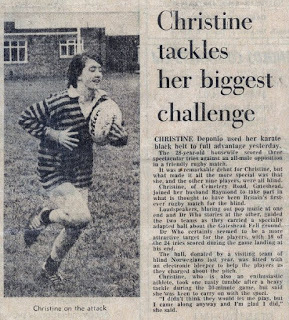 Myself at the age of 28 in 1982 when I played with an all male blind rugby team which is thought to have been the first match of it’s kind ever to be played in Britain. 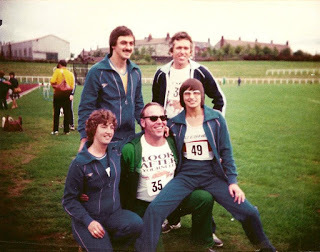 I also joined in the track and field squad at Gateshead, even competing in The National Games for the blind. I achieved Gold, silver and bronze for the Shot put, Discus, Javelin, Long jump, High jump and 100m sprint. 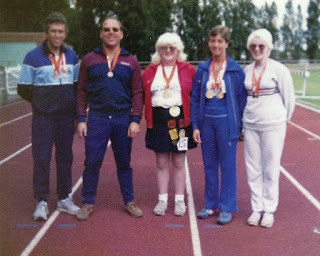 I was selected for the Great Britain squad and had began training for the Paralympic Games in Los Angles. Unfortunately this was cruel cut short when I had to stop due to husbands accident. 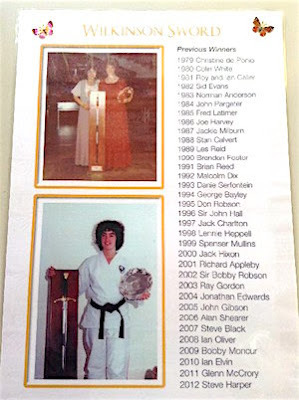 At the age of 25 I was the first person ever to receive the Wilkinson Sword Award for outstanding achievement in sport and I am still the only woman to ever have be awarded it in 36 years. I believe that the world can be our oyster and life is what we make if it. It is up to us which pathway we choose to go down. Wilkinson Sword Award. Picture above is Christine with coach Sandra Coates at the 1979 Sports Awards. Picture below is Christine with the Wilkinson Sword and the Silver Salver award. 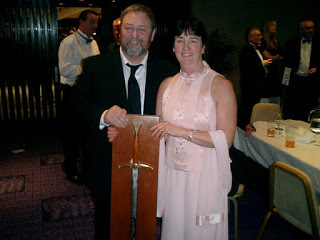 Me and winner Steve Black at the 30 year anniversary of the Wilkinson Sword awards. If we long to reach our dreams and goals in life whatever they may be, disability or no disability, we can succeed. Don’t let anything or anyone dampen your morale or stand in the way of you reaching your goals. The key to the door and to success is to have confidence, faith, hope, determination and most of all belief in yourself. So whatever the reason for your disability or illness remember there is always a way forward.